"I personally like the older design"
"I think this mod is a nightmare." Looking for a tiny starfighter that's almost powerful enough to take out a cruiser on it's own? The idea with this ship is to have a strong, fully-loaded ship that is still weak enough to be interesting. Choose a variant loadout at the start beacon! Have an entire set of systems and weapons from the start - an upgrade tree just waiting for you to feed on your spare scrap! *provided you have the resources to do so. ...It won't be an easy fight. Infact, I cannot promise that you can actually beat the game with this - it's more an experiment or a horrible challenge. Download links follow, with a full description of the mod below. A quick update has added mod-specific tips at the start beacon, plus another to replace a sprite I forgot to add in. Since the mod changes UI elements, the download also includes a patch for anyone who runs Shiny!UI. 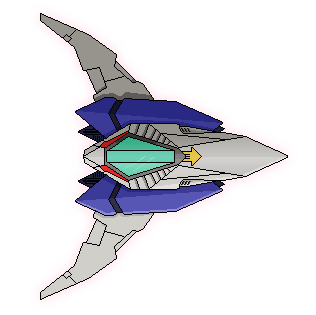 The Arwing is a very small, but very powerful fighter ship. It is only 4 rooms big, but starts with an almost entire set of systems. In order to fit so much into such a small space, the ship uses Layered Systems - each room houses at least two systems, if not more. 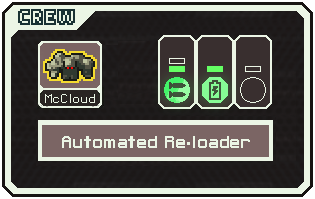 It is an AI ship - which also means all your systems are constantly manned. This is very useful, since you need all the dodge you can get. The Cockpit seats the pilot, most of your subsystems, and your life support. The Left Wing houses cloaking and a single-bay weapon system, while the Right Wing holds the engines and an artillery system. If one wing goes down, you still have the attack and defensive capabilities of the other. 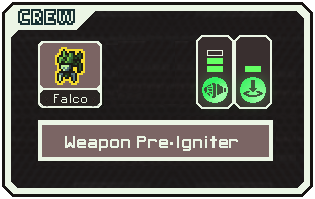 At the start-game beacon, you'll get the chance to choose a pilot. The pilots races are picked to represent the aspects of the characters in the games, and because who has time to make sprites? Each pilot has a customized ship, with at least one additional system, a ship upgrade, and a powerful Augment. 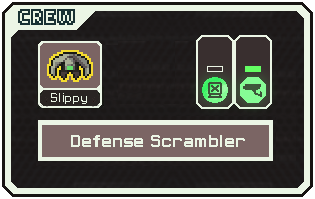 The playstyle of the ship will be greatly effected by this, so choose wisely. The Laser Cannon is a fairly simple but versatile weapon; 1 shot 1 damage, with a cooldown boost and the ability to charge a second shot. The first upgrade for it, the Twin laser, adds a second projectile to each volley, and speeds up cooldown. Later you'll be able to use the Hyper Laser, which adds ion damage to each laser, and again reduces cooldown. The Smart Bomb auto aims and fires like any good artillery. It acts as a 1 damage missile with hullburst and /huge/ sys damage, with the potential to hit up to 3 rooms. It won't completely destroy most ships, but can definitely turn the tide of a battle. --As of v2, Fox is no longer the only pilot without a full loadout, and starts with Mind Control installed. This pack is now included with the standard Arwing Package, and is highly recommended to be used. With this pack installed, you no-longer start the game with a full inventory. Instead, all the stores in the game now give you the option to contact the Great Fox, which can provide you with free power-ups. The power-ups are unlocked as you upgrade your systems, so you'll always find something that matches your current power level. These unlocks aren't limited to just the weapon system, though - the more systems you upgrade, the more options you'll have. All in all, it makes for a more interesting, hopefully more balanced, style of gameplay. Please make sure you place the pack after the ship in your mod load order. There may be spoilers for the missions from page two onwards. --As of v2, some new options have been added to the Great Fox store. Let me know if you have any let's plays you'd like featured on this page! Many thanks to Rad-82, Styles-rj, Yizzy, Sleeper Service, and Chrono Vortex for the kind words and help. The Start Event code, and much of the event-driven aspects, were built using Rad-82's "Auto Terminator" as a base. This is a fan-made mod, and is not for profit. Characters, names, sounds, belong to Nintendo. If there are any issues, please let me know and I will do my best to rectify them. Jon - GenCool - PuppetSquid. Last edited by Gencool on Sat Jan 02, 2016 3:39 pm, edited 20 times in total. I see no mention of shields. Are there shields? And if so, where are they located? Also, Mantis Katatonik might do a video run of it. The 'custom' systems (shields, teleporter, hacking, mind control and battery) all go in the fuselage, where the Drone Bay is. At most, that room can have 3 systems in it; 1 'custom' system, the drone bay, and the battery. It's also worth noting that only two ship variants (Fox and Peppy) can have personal shields installed, so for many playthroughs it might not even be an issue. I'l update the first post to reflect this better. Send my best to Katatonik. Would love to see a veteran hunter take a spin in this ship. Gencool wrote: Since the custom drones are all powerless, ionization won't affect them. Now come to think of it, what happens if you have a full crew somehow and you have onboard drones? Where do they go? There's only 8 spaces on the ship. Yeah, I'll be sure to let him know from my secret hiding location. You can't actually de-power 0-power drones, weirdly enough. I'm kind of banking on the idea that players will keep all the starting equipment. See, it's all pretty much powerful enough to last to the endgame, it's all tailored to cover some major weaknesses in the ship, and it all builds into the theme and gameplay. Also, I love how on the ball Sleeps is with the AE Mods thread. Good work, sir. Damn, my assassination attempt didn't work. Who knew Dread Pirate Tuco was such a coward? Worst of all, Mantis Katatonik is alive and he's just made a video run chronicling his experiences with the ship. Check it out and tell me how I can do better at taking his life out and reclaiming my channel. Styles how are you so good at finding errors in my mods? This should work, to get rid of shield drones from stores, right? Tactics wise, I find that using a laser that requires less slots than your weapon system actually has really helps against beams. The extra upgrade slot acts like a buffer, meaning you can take a point of damage to the room without instantly loosing your weapon system. It's pretty useful when you only have 1 weapon slot, especially when you get to the higher levels. Fully upgrading your system just for the Smart Hyper laser isn't a bad idea. It should be fine to use, unless there's something I've missed? Once this version's fully working, I think I'ma take a break from modding for a while. I get way too addicted to it. Unfortunately I had an idea for a mod supplement for this. If anyone's interested in picking up a bunch of events, let me know, and we'll chat about ideas. My tactics tend to revolve around putting things at the max . 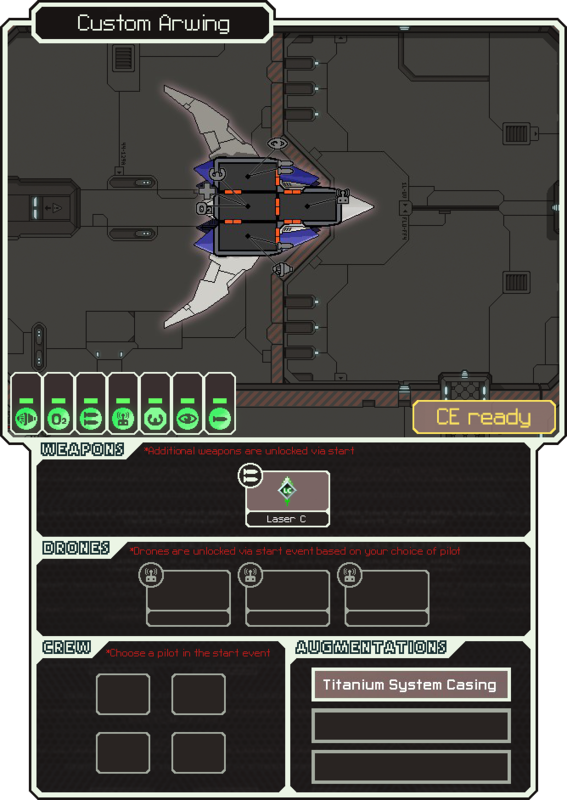 I guess that's a bad strategy in this case and I should wait for more power before jumping to the next gun. I think Katatonik mentioned it was like the Vulcan at least once somewhere in there, but because of all the ion going on, it was hard to acquire full charges. But it is noticeable. That's interesting. Maybe it was a pre-AE thing where it crashed the game. So I won't expect the Wolfen and Starwolf any time soon? Y'know, some things are just too cool to leave alone, and this one's easy enough to at least have a go at. I'm not making any new image assets, though, so no Wolf / etc, and definitely no new boss events. Sorry!